"With its ocean views, plentiful benches, and nearby downtown Ogunquit, the Marginal Way in Maine is one of New England's most beloved scenic coastal walks"
"Once you have the dark and light pattern down, you have your picture"
Immerse yourself for three full days of painting the picturesque and breathtaking views all along The Marginal Way. Learn the unique skills of Alla Prima sketching in the medium of your choice. Learn to compose your best composition quickly and how to rapidly transpose your idea onto canvas. Learn to see and evaluate your subject as interlocking shapes of light, middle and dark values instead of seeing them as the objects they represent. We will strive to save the 'suggestion' of detail until the very end. By taking this more abstract approach to painting, we simplify our subject into broad patterns that has us getting to a finished quality in a short time. By simplifying, we actually say more then if we tried to put every little detail into the painting. Ogunquit means "beautiful place by the sea" in the indigenous Abenaki language and perfectly sums up this area of southern Maine. The Marginal Way is a one mile long footpath that is a remarkable tribute to nature. The path hugs the rocky edge of the Atlantic and meanders through bayberry, honeysuckle and bitersweet, gnarled shrubs of fragrant pink and white sea roses and offers vista after vista of seaside grandeur. There is no shortage of inspiration here for the artist.. The painter, Charles Woodbury ran a summer school here for 36 years, often times finding inspiration along this strip of rocky coastline. This will be our 20th year teaching this annual workshop. To make it a special occasion and as a way to say thank you to everyone who has attended, or thought about attending this or any of our other workshops, we're offering two more free days for those wanting to make this a five day workshop. The two extra days will be full days of painting anywhere on the island, followed by invaluable and fun critique sessions at 4:30 PM. After Friday's critique, we will hold a drawing for one of David's 9x12 original Monhegan paintings. On Wednesday, we are bringing back Dueling Demos. Pam and David race against time and each other, painting the same scene. We will begin the workshop week on Sunday July 28th with our traditional meet and greet gathering at 7:30 PM. At 7:45 we can drink a glass of wine and toast the Monhegan sunset as its happening. Monhegan Island is known for spectacular sunsets. Painting on location anywhere on the island. You choose your own starting time based on your desired schedule. The group critique is from 4:30 - 5:30. Wine and cheese will be served. Paint on location anywhere on the island. You choose your own starting time based on your desired schedule. The group critique is from 4:30 - 5:30. Wine and cheese will be served. The drawing for an original 9x12 David Lussier painting of Monhegan Island follows the critique! Learn to paint Alla Prima with total confidence. The term Alla Prima means 'At One Go'. In his remarkable treatise 'In Praise Of Painterly Painters', the late artist, author and teacher, Charles Movalli wrote; painterly painters are surrounded by seeming contradictions. They finish by not finishing, include by leaving out, paint more by painting less. Their means are easy to see, the results, immediately felt. But how such seemingly insufficient means lead to these results is a mystery. In this three-day workshop, let us take the mystery out of this painterly approach. Economy of stroke is within every painters grasp if they are willing to approach the painting process with a 'Less Is More' mind set. More than half the battle is a willingness to load the brush with enough paint and make each stroke count for something. Over the course of the three days, we will strive for this. On day one, we will employ the use of just value and shapes. No color allowed! Think of this process like learning to juggle. First we are taught to juggle with only two balls, Value and Shapes. I will demo in 5 values with large premixed piles of Burnt Umber and White. There will be enough piles of premixed paint leftover for each participant to use for the day. Each student will then work on their own painting and be asked to use up all the paint they are given. Good brushwork happens when oil paint is 'built up' on top of oil paint. This lesson will help drive that point home. On day two, I will demo using color. I will emphasize and explore warm and cool colors and how to use them effectively. With my help, each student will first mix up a few large piles of basic colors that represent the main value shapes, for their individual painting. Then we will employ the same method of painting from day one. The Wednesday demo will be our Dueling Demo, where Pam and I race against time and paint the same scene. The dueling demo provides invaluable insight into separate approaches toward the same subject matter. You will be encouraged to tackle up to three paintings each day using the methods you've been taught. Day three will end with a group critique. For those staying on for the two day bonus, you will paint each day at locations of your own choosing, followed by a critique at 4:30 on both days. Monhegan Island is a tiny island about 12 miles off the coast of Maine and reachable by ferry. As soon as you step off the boat, you'll begin to feel Monhegan's special charm. The painting subjects on this quaint artist's paradise have barely changed in over one hundred years and everywhere you look is another painting waiting to be captured on your canvas. Robert Henri ventured out to Monhegan and was so enamored by its subject matter that he painted 25 small oil sketches in a four day period. Everything about Monhegan Island is special and the experience will stay with you for the rest of your life. The link to our supply list below is only a suggested list. If you have a palette of colors, a medium and a supply of brushes that is working for you, then by all means, you are welcome to bring what you like. I do highly recommend a warm and cool tube each of Red, Yellow and Blue. Time: 9:00 - 4:00 Monday - Wednesday / A critique lasting one hour begins at 4:30 on Thursday and Friday. The first link below will take you to the Monhegan Welcome website. The website offers information about planning your trip to Monhegan, along with all accommodation choices, and boat information to get you there from the mainland and a myriad of other things about Monhegan. The other links, 'Robert Henri And His Circle' and 'Monhegan-An Artist's Island' are enjoyable articles that will acquaint you with Monhegan's history and the remarkable treatise 'In Praise Of Painterly Painters', written by Charles Movalli, is an invaluable article about the act of painting. Learn to paint Alla Prima with total confidence. Express your own unique vision by learning how to simplify shapes, color and values effectively. Find out why each mark on the canvas needs to count and how to achieve that goal. The term Alla Prima means 'At One Go'. In his remarkable treatise 'In Praise Of Painterly Painters', the late artist, author and teacher, Charles Movalli wrote; painterly painters are surrounded by seeming contradictions. They finish by not finishing, include by leaving out, paint more by painting less. Their means are easy to see, the results, immediately felt. But how such seemingly insufficient means lead to these results is a mystery. In this three-day workshop, let us take the mystery out of this painterly approach. Economy of stroke is within every painters grasp if they are willing to approach the painting process with a 'Less Is More' mind set. More than half the battle is a willingness to load the brush with enough paint and to make each stroke count. Over the course of the three days, we will strive for this. In my plein air demonstrations, I will stress the importance of first learning to visualize and organize your subject matter into large shapes in a few simple values. Using just one color and white, I will show you how to come up with your best plan possible by first painting a very simple 5-10 minute value sketch. With this sketch in hand, you essentially have your finished idea. This is extremely freeing to the overall process. I will show you how to then quickly interpret your subject in color and how to mix up a few large piles of color that pertain to the big shapes from your sketch. From here, you have what you need to cover the canvas quickly and with enough paint. The painting can then be brought to any degree of finish that suits your own individual expression. In each demonstration, I will show you what 'finish' means to me and how I achieve it. This class is appropriate for intermediate through advanced levels. Learn to control the myriad of colors your eyes see when face to face with the autumn landscape. The White Mountains offer up some of the most spectacular and breathtaking landscape in New England. I will begin each day with a one hour demonstration and discussion of my working methods. In an orderly step by step process, I will show you How I simplify shapes, color and value to achieve a successful painting. I will share my knowledge of how the bright autumn colors of red, yellow and orange recede into the distance. This is an important lesson in being able to give your painting the sense that it is infused with light and atmosphere. I will offer individual help to each student towards a successful painting each day. In this indoor studio workshop we will be painting a series of rapid still-life sketches to increase your speed while honing visual memory skills. Please note: This is a Friday/Saturday workshop. This workshop is always well received and participants leave with a renewed sense of self confidence. During the two day workshop you will be painting a series of quick 8x10 sketches and will be given a time limit of 40 minutes for each painting. David will lecture and demonstrate the quick sketch method of making use of negative space, massing in the largest shape relationships in the simplest value plan possible and how to say more with less. As each new sketch is underway, you will be given visual cues and instruction to help you achieve the desired results. Regardless of your skill level, you will learn how to be more spontaneous with your decision making and learn to say more with less. There is a lot of powerful and positive energy that flows through the room during this weekend event! Time: 9:00 - 4:00 each day. Please note: This is a Friday/Saturday workshop. As a landscape painter today, you have the advantage of being able to gather a lot of reference photos quickly and easily with a digital camera. It makes all the sense in the world to get all the visual cues you can to help jog the memory back in the studio for help with finishing touches or to work up studio paintings. As useful as photos can be, the truth is that a camera is not able to capture what your eyes are capable of seeing and your heart is capable of feeling. Merely copying a photo will never result in a real sense of depth, and colors and values will be untrue to what nature gives us. As a painter, who has been immersed in the national plein air scene for more than twenty years, I have formulated concepts and truths about how I can achieve a feeling of light, atmosphere and emotion in paintings that I work up in the studio. I will share these concepts with you in this two day workshop. Through demos, handouts and a lot of discussion, both as a group and individually, you will learn how to interpret photos and make changes based on the truths found in nature and how to fill your paintings with a real sense of light and atmosphere. Composition, color, values, line and edges will all be discussed. I want to help you to not only interpret photos correctly but how to make marks that are expressive and uniquely your own. You can work from your own photo choices or look through my library of hundreds of photo references. Learn to paint convincing nocturnes in the studio. Explore the nuances and color effects of moonlight along with the various transitional effects of warm and cool light from street lamps, window light and even candle light. Over the course of many years, I have explored painting nocturnes on site and in the studio. At one point, in order to fully grasp the various lighting and value shifts adherent in night scenes, I explored and painted 30 nocturnes in 30 days. My goal was to paint night scenes from a variety of timelines; from the moment it became dusk until late in the evening and also very early morning. For each painting, I would arrive at a scene, sketch, and take notes and I’d capture a snap-shot photo to help me recall how elements went together. Then I would recreate the feeling and the light of each precise moment, in the studio the next day. It was a real eye opener. I learned a great deal and I want to share it with you. 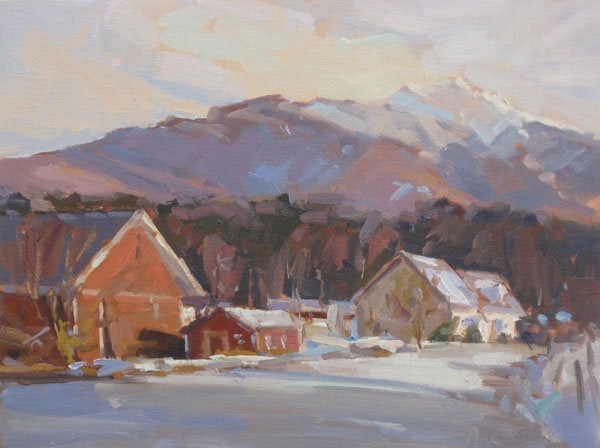 Learn to paint the beauty of a winter landscape in the comfort of a warm studio in the heart of the White Mountains. Learn the general guidelines for painting snow scenes that include choosing the right palette for the task, understanding how to capture the high key effect of bright sunlight and how reflected light gets bounced around a snow covered landscape. David will begin each day with a one hour demonstration and discussion of his working methods in an orderly step by step process of simplifying shapes, color and value to achieve a successful painting infused with color and light. Students will work from their own photos or choose a photo from our vast library of 8x10 winter landscape references. David will offer individual help to each student towards a successful painting each day. The format will be similar to our basic 3 day workshop schedule. Click Here. Learn invaluable tools and how to tackle Alla Prima painting with confidence. The term Alla Prima means 'At One Go'. In his remarkable treatise 'In Praise Of Painterly Painters', the late artist, author and teacher, Charles Movalli wrote; painterly painters are surrounded by seeming contradictions.They finish by not finishing, include by leaving out, paint more by painting less. Their means are easy to see, the results, immediately felt. But how such seemingly insufficient means lead to these results is a mystery. In this three-day workshop, let us take the mystery out of this painterly approach. Economy of stroke is within every painters grasp if they are willing to approach the painting process with a 'Less Is More' mind set. More than half the battle is a willingness to load the brush with enough paint and make each stroke count for something. Over the three days, we will strive for this. On day one, we will employ the use of just value and shapes. Think of this process like learning to juggle. First we learn by juggling with only two balls, Value and Shapes. I will demo in 5 values with large premixed piles of Burnt Umber and White. There will be enough piles of premixed paint left over for everyone to use for the day. Each student will then work on their own painting and be asked to use up all the paint they are given. Good brushwork happens when oil paint is 'built up' on top of oil paint and this lesson will help you fully understand the importance of good brushwork and how to apply paint convincingly. Sunlight is represented best by thick impasto passages and these passages help the viewer to literally feel the sunlight. On day two and three, we will use color, and with my help, each student will first mix up a few large piles of basic color and value shapes that pertain to their individual painting. Then you will employ the same method of painting from day one. We will paint in the Naples Botanical Garden on Day Three. This is a 170-acre world-class garden paradise. Pam and I will both demo simultaneously on this day. Our ‘Dueling Demo’ is a great way to see similar methods being employed, but with slightly different approaches toward individual style. Read 'In Praise Of Painterly Painters' by Charles Movalli in its entirety CLICK HERE. Read some thoughts about Alla Prima painting CLICK HERE. As a landscape painter today, you have the advantage of being able to gather a lot of reference photos quickly and easily with a digital camera. It makes all the sense in the world to get all the visual cues you can to help jog the memory back in the studio for help with finishing touches or to work up studio paintings. As useful as photos the truth is that a camera is not able to capture what your eyes are capable of seeing and your heart is capable of feeling. Merely copying a photo will never result in a real sense of depth, and colors and values will be untrue to what nature gives us. In this two day workshop, through demos, handouts and a lot of discussion, both as a group and individually, you will learn how to interpret photos and make changes based on the truth found in nature and how to fill your paintings with a real sense of light and atmosphere. Composition, color, values, line and edges will all be discussed. I want to help you to not only interpret photos correctly but how to make marks that are expressive and uniquely your own. You can work from your own photo choices or look through my library of hundreds of photo references. In this two-day workshop, let us take the mystery out of this painterly approach. Economy of stroke is within every painters grasp if they are willing to approach the painting process with a 'Less Is More' mind set. More than half the battle is a willingness to load the brush with enough paint and make each stroke count for something. Over the weekend, we will strive for this. On day one, we will employ the use of just value and shapes. No color allowed! Think of this process like learning to juggle. First we learn to juggle with only two balls, Value and Shapes. I will demo in 5 values with large premixed piles of Burnt Umber and White. There will be enough piles of premixed paint leftover for each participant to use for the day. Each student will then work on their own painting and be asked to use up all the paint that they are given. Good brushwork happens when oil paint is 'built up' on top of oil paint. This lesson will help drive that point home. On day two, we will use color, and with my help, each student will first mix up a few large piles of basic color and value shapes, that pertain to their individual painting. Then we will employ the same method of painting from day one. Look! Your'e juggling! To read 'In Praise Of Painterly Painters' by Charles Movalli in its entirety, CLICK HERE. This class is appropriate for beginner through advanced levels. Plein Air Painting Tuesdays - 6 Week Session! Learn the unique skills of outdoor, "Plein air" painting each Tuesday morning, in the picturesque coastal town of Ogunquit, Maine and nearby inlets and coves. Ogunquit is home to one of America's original art colonies and a renowned plein air painting summer school founded by influential Perkins Cove artist and teacher, Charles H. Woodbury in 1898. We will discuss Woodbury's teaching philosophy as it relates to "The art of seeing", perceptual drawing, seeing and painting. Through demonstration, discussion, critiques and side-by-side painting in the field, we will explore what it means to see the world through the eyes of an artist. Join me this summer as part of the Ogunquit Summer School of Art, as we carry on this great tradition, painting in the shadows of Homer, Hopper, Henri and Woodbury. Equipment rental : ($50 day) includes outdoor easel, pallet, paint, mediums, brushes and 1 (8x10") canvas. I will be supplying all the paint and painting panels needed for this two day workshop. Learn invaluable tools and how to tackle Alla Prima painting with confidence. The term Alla Prima means 'At One Go'. In his remarkable treatise 'In Praise Of Painterly Painters', the late artist, author and teacher, Charles Movalli wrote; painterly painters are surrounded by seeming contradictions. They finish by not finishing, include by leaving out, paint more by painting less. Their means are easy to see, the results, immediately felt. But how such seemingly insufficient means lead to these results is a mystery. In this two-day plein air workshop, we will paint along the coastline of southern Maine. Let us take the mystery out of this method of plein air painting . Economy of stroke is within every painters grasp if they are willing to approach the painting process with a 'Less Is More' mind set. More than half the battle is a willingness to load the brush with enough paint and make each stroke count for something. Over the weekend, we will strive for this. On day one, I will show you how to simplify the painting process by using only three colors and white. This triad of colors is not your typical palette of red, yellow and blue, but one that I've utilized in the field with great success. On day two I will introduce you to another triad of three colors that is very effective at capturing bright sunlight. Over the course of the weekend, using the paint and panels that I supply you with, we will explore Alla Prima techniques in depth with regards to paint handling, color and value choices and how to specifically utilize both brushes and a palette knife to infuse our paintings with an immediacy and vibrancy that catches the viewers eye and holds their attention. For some thoughts about Alla Prima painting, CLICK HERE. We will spend our time painting in the New Hampshire/Maine seacoast area. In part one of Mastering Alla Prima Painting we worked in the studio. For part two we will be exploring the alla prima method outdoors plein air. Everyone is welcome. There is no need to have participated in the studio workshop in order to benefit from this plein air workshop. In this two-day plein air workshop, let us take the mystery out of this painterly approach. Economy of stroke is within every painters grasp if they are willing to approach the painting process with a 'Less Is More' mind set. More than half the battle is a willingness to load the brush with enough paint and make each stroke count for something. Over the weekend, we will strive for this. On day one, I will be supplying you with a 16x20 inch panel ready to go. Each panel will be taped off in sections to give you four 8x10 inch painting surfaces. Using the same scene, I will demonstrate 3 separate ways to approach blocking in a painting quickly. These are tried and true methods I incorporate when I am painting in plein air competitions and quick draw events. I want to be able to get to the real painting of my subject before the light changes. I will explain why one of the three block-in approaches works best for my subject and light source and then quickly paint an Alla Prima Sketch on the fourth section of my 16x20 inch panel. Each student will then work on their own painting and be asked to use their 16x20 panel in the same way. On day two we will explore Alla Prima techniques in more depth with regards to paint handling, color and value choices and specific brushwork that can be employed to help capture light and atmospheric effects in our painting. Students should come prepared with the mind set of painting 2 or 3 paintings on day two. 9x12 and 11x14 inch panels are ideal for this. This 3-day workshop is through The Art League Of Ocean City, Center For The Arts. Learn to quickly evaluate the subject before you and break it down to simple shapes to form the composition. Then, express how the light affects your subject using value and color. We will cover the painting process from start to finish. Getting a solid start doesn't necessarily mean a solid finish unless the painter fully understands what makes a painting look finished. Saying more with less allows us to concentrate on what's important to the painting but we do need to avoid the common pitfall of not adding enough 'sense' of detail and eye candy to keep the viewer interested. The great artist and author, Charles Movalli used to say, that as painters, we are actually in the entertainment business. He would say that it's every painter’s job to entertain the viewer throughout the painting. Expressive brushwork and making marks that count are tantamount to this process. Ogunquit literally means 'beautiful place by the sea' and is home to one of the oldest artist colonies in New England. Today it is still commonplace to see artists and fisherman working along Perkins Cove. This 3-day plein air workshop is being held at the Ogunquit Summer School Of Art. We are looking forward to teaching and painting again in this beautiful location and I hope you will join us. Todd Bonita who runs the summer school is a very gracious and attentive workshop host. We are thrilled to announce that this workshop will now run annually. We strive to teach the building blocks of landscape painting while nurturing each person’s individual style and personality. Every good landscape painting is rooted in sound painting principles and the truth that we find in nature. In order for a painting to be of personal expression, the artist must infuse it with his or her own imagination, personality and inventiveness. We work with each student toward this goal. Students will learn to work with complementary color palettes to simplify the process and achieve harmony. No amount of good brushwork and great color will turn a painting into a success if it doesn't first have a solid composition. Great paintings are the result of good subject matter and the painters ability to rearrange the shapes in a balanced and pleasing way on the canvas. In this workshop we will explore the work of some of the greats to see how they achieved the best composition from their subject. We are going to work with our full color harmony palette. This is suitable for those students who haven' t worked with us before as an introduction to our palette and for those students who have been working with us for the last few years. David will be demonstrating using the palette for direct painting, using the complementary and triad knowledge to make harmonious color decisions. Students will work from their own photos or choose a photo from our library of winter landscape references. In this workshop we will delve into how to be more effective with the marks we make on our canvas. Come learn how to make each brushstroke count and have a purpose in your painting. We will look at the work of Emile Gruppe, one of Cape Ann's most successful, prolific and painterly painters. We are going to work with our full color harmony palette. This is suitable for those students who haven' t worked with us before as an introduction to our palette and for those students who have been working with us for the last few years. David will be demonstrating using the palette for direct painting, using the complementary and triad knowledge to make harmonious color decisions. Students will be encouraged to work on a few painting exercises pertaining to brushwork before working on their own painting. Students can work from a photo reference of their own or choose one from our photo library of landscape references. In the winter and early spring of 2014, David painted thirty nocturnes as an exploration into the subject. Most of the paintings were of the snow covered landscape and were painted at various times between early evening and twilight. There are certain key elements to know and understand how to convey in order to capture the feeling of a winter nocturne painting. Come learn and explore as David shares what he learned from his painting experience. We are going to work with our full color harmony palette. This is suitable for those students who haven' t worked with us before as an introduction to our palette and for those students who have been working with us for the last few years. David will be demonstrating using the palette for direct painting, using the complementary and triad knowledge to make harmonious color decisions. He will be demonstrating an analogous color palette painted directly. Students will then work from a photo reference of their own or choose one from our library of landscape photo references. We are going to work with our full color harmony palette. This is suitable for those students who haven' t worked with us before as an introduction to our palette and for those students who have been working with us for the last few years. David will be demonstrating using the palette for direct painting, using the complementary and triad knowledge to make harmonious color decisions. He will be demonstrating a analogous color palette painted directly. Students will then work from a photo reference of their own or choose one from our photo library of landscape reference material.